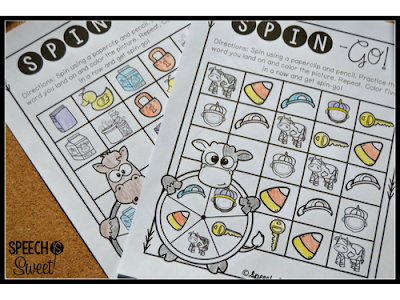 Spinner games are all the rage in my speech room right now! It’s amazing how much fun a kid can have with just a paperclip and a colored pencil! 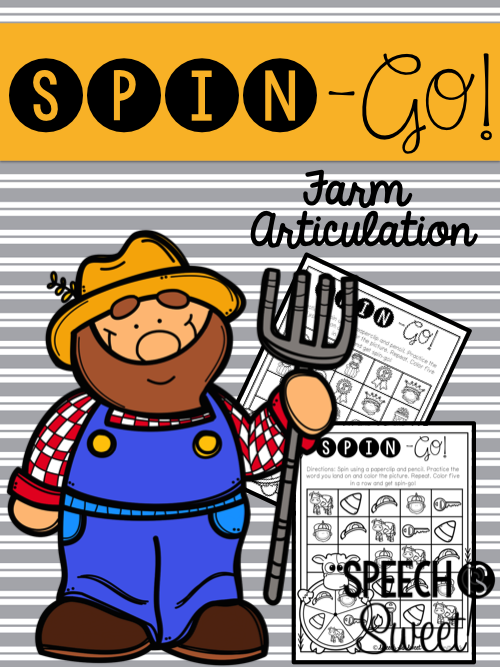 I created a little game called “Spin-Go” for my therapy room! 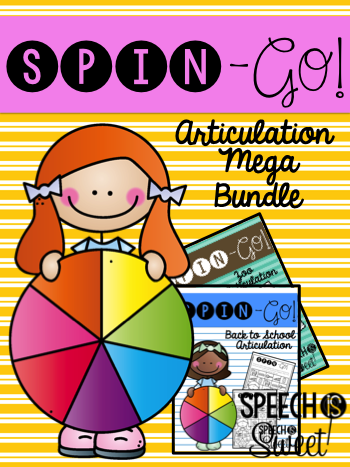 It’s super fun and perfect for the preschool and primary crowd. A student spins the spinner and then practices the word that they land on. After they practice their word they get to color the matching picture and then they repeat! When they color five pictures in a row, they get spin-go! It’s a great game to elicit tons of repetitive drills and it also keeps your students engaged as they wait to work one-on-one with you! 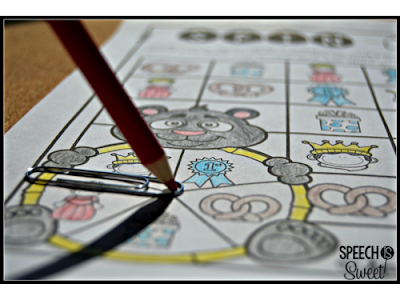 I love having a wide variety of NO PREP games and activities in my toolbox! 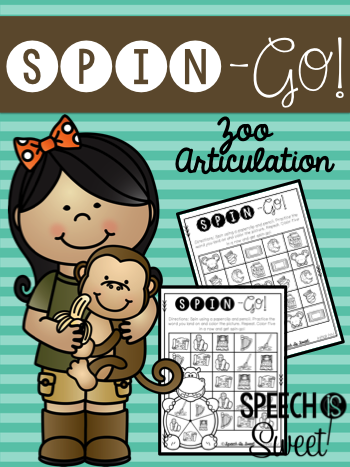 Life as a school-based SLP is very hectic and I don’t always have time to print, cut, and laminate every single activity. So of course, I had to have these games for all themes and occasions! 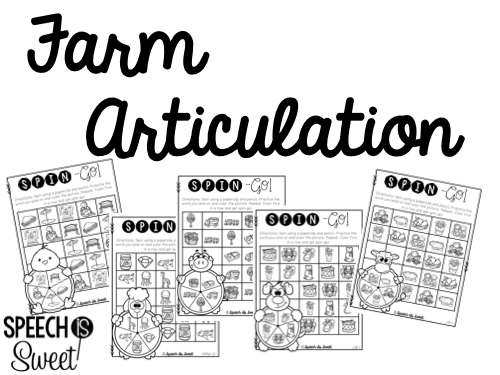 Currently, I have Back To School, Zoo, and Farm themes! I have many more themes planned so I went ahead and created a growing bundle. It’s currently 50% off until more packets are added. This packet contains a variety of zoo animals such as: lions, hippos, giraffes, zebras, pandas, monkeys, gorillas, and more! These games can be used year around or during a zoo/animal theme! 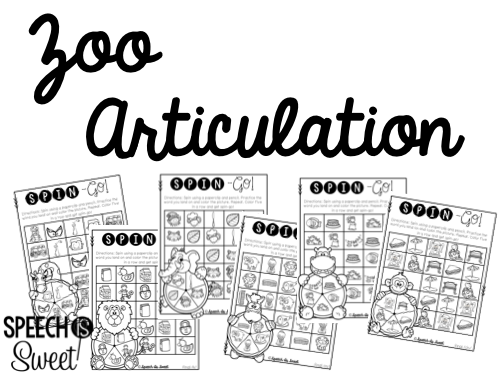 This is also a great way to introduce students to zoo vocabulary! They can practice their articulation and learn about the zoo at the same time. There’s also a farm version!